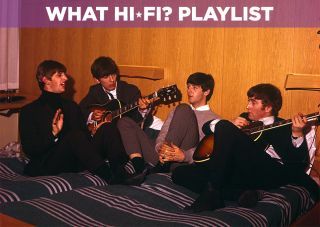 The Beatles: Eight Days a Week - The Touring Years - Blu-ray review | What Hi-Fi? Entertaining is key in Ron Howard's stirringly sentimental documentary about the world's favourite quartet on tour in the early 1960s. “What’s left to say?” That wouldn’t be an unreasonable reaction to news of Ron Howard’s documentary about one of the most documented bands in history. But it would be missing the apparent intention of his project, which like the purpose of a primary school trip to the zoo, seems first and foremost one of entertainment rather than educatation. It hasn’t come about from some new revelation of a long-buried secret, and doesn’t attempt to barge down any previously unopened doors, as the perhaps disingenuous tagline – ‘The band you know. The story you don’t’ – may have you believe. Actually, The Beatles: Eight Days a Week - The Touring Years is almost entirely familiar and incontrovertible; a nostalgia-inducing love letter to the world’s favourite quartet and the boon and gloom of the period they rocked and rolled in. More specifically, as the title suggests, to the band’s touring heydays – between 1962 and 1966, pre-Sgt. Pepper’s Lonely Hearts Club – where they played together over 1200 times, breaking out of Liverpool’s The Cavern Club into wider Europe, and, following that Ed Sullivan TV appearance in 1964, which over 73 million people tuned into, the ‘motherland' for British bands at that time: America. By the time they quit touring in August 1966, they had performed 166 concerts in 90 cities around the world. Director and co-producer Howard – the actor-turned-director behind the likes of Apollo 13, A Beautiful Mind and The Da Vinci Code – didn’t undergo the task alone; Paul McCartney, Ringo Star, and John Lennon's and George Harrison’s widows Yoko Ono and Olivia Harrison were aboard, with the two surviving band members providing the sort of fresh commentary and insight that never tires, in between archival footage of TV appearances, gigs and on-the-road shenanigans. Those rubbing their hands together at the prospect of two hours of concert footage should manage their expectations, however there’s no doubt the documentary is musically rich, and covers most of the band’s hits across that time. After all, we are talking about an era where the band were in their prime and had several number one albums, including Please Please Me, With The Beatles, A Hard Day’s Night, Help! and Revolver. It opens with an energetic performance of She Loves You from Manchester’s ABC cinema in 1963, includes several TV appearances and snippets from their stadium tours, and goes behind the making of their two films between tour breaks, A Hard Day’s Night and Help!, where you see the band’s initial delirium and later boredom towards filmmaking. The specificity and chronology of the on-the-road spotlight means you don’t feel you’re being fed the same story for the hundredth time. Predominantly it’s the band’s music and stage presence, and the cheeky, jocular disposition of the mop-headed, suited teenagers that lie at the core. Its title reflecting their hectic schedule, the documentary acts as the devoted fan to offer empirical tidbits: Harrison’s excitement at hearing their songs on a transistor radio for the first time; Lennon and McCartney writing songs in their hotel rooms with just acoustic guitars; and the fact that during a sell-out show in New York’s 56,000-capacity Shea Stadium the screams were so loud they couldn’t hear themselves sing and had to rely on each other’s bum wiggles and head nods for music cues. It's an incredible journey, and Howard gets across the personal and human side of it wonderfully. Sure, there’s enough context to deem it an all-you-need-to-know for any Beatles novice, accompanied by some anecdotal scene painting from the likes of Eddie Izzard, Whoopie Goldberg and Elvis Costello too. But it doesn’t hark on, and is ultimately more of a Sparknotes summary box than a near-three-hour history lecture. There’s a place for emphatic analysis and we’re glad it’s been saved for the special features disc, which comes as part of the Deluxe Collector's Edition Blu-ray edition. With a running time of over 100 minutes, it acts as a comprehensive filler to the documentary’s contouring, offering a wider window into the studio recording process, each member's musicianship and creative input, and the very early-day formation and dynamics of the band. There’s also an alternative opening to film featuring Malcolm Gladwell's commentary and, as if intent on being the Christmas gift that keeps on giving, five live performances available in DTS-HD Master Audio 5.1 and Dolby Digital 5.1, including Can't Buy Me Love at the NME Awards and You Can't Do That in Melbourne in 1964, and Help! in Blackpool in 1965. Got a surround sound system? You're in for an absolute treat.